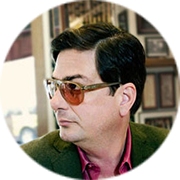 Roman Coppola grew up in the world of filmmaking, and has developed his directing skills by working in multiple capacities: from sound recordist to cinematographer, to writer, producer and inventor. He began his directing career with visual effects and second unit direction of Bram Stoker’s Dracula, which garnered a BAFTA Award nomination for Visual Effects. His first feature film, C.Q., premiered at the Cannes Film Festival and was well received critically. His second feature, A Glimpse Inside The Mind of Charles Swan III, premiered at The Rome Film Festival. Roman was a producer and co-writer for Wes Anderson’s The Darjeeling Limited and co-wrote with Wes the screenplay for Wes’ film, Moonrise Kingdom, for which they were nominated for an Academy Award. Roman has also lent his talents to 2nd Unit Direction on productions Lost In Translation, Marie Antoinette, and The Life Aquatic and Special Photography Unit for Wes Anderson’s film, The Grand Budapest Hotel. Roman is also the founder and owner of The Directors Bureau, an award-winning commercial and music video production company. It is at The Directors Bureau that Roman has directed his highly acclaimed and influential music videos and commercials, for bands such as The Strokes, Fat Boy Slim, Daft Punk, and for a long list of commercial clients. His work earned him various industry honors including a Grammy nomination and two MTV Music Video Awards. Also, Roman’s stream-of-consciousness video for the Phoenix “Funky Squaredance” track was invited into the permanent collection at The Museum of Modern Art. Mr. Coppola is president of the pioneering San Francisco-based film company American Zoetrope. Among his producing credits are Sofia Coppola’s Somewhere, Walter Salles’ On the Road based on Jack Kerouac’s iconic novel, and Sofia’s latest film, The Bling Ring. Mozart in the Jungle, a TV pilot Roman produced and co-wrote with Jason Schwartzman and Alex Timbers was recently ordered to series by Amazon Studios with nine episodes currently in production.